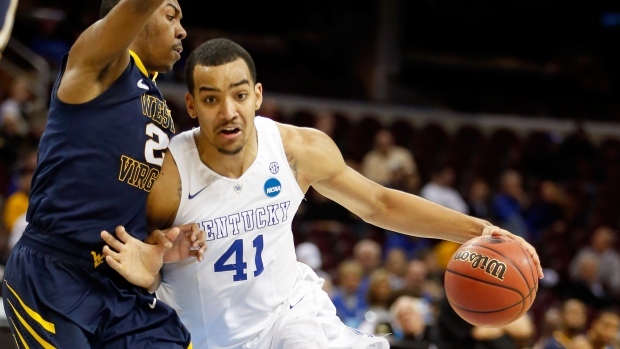 LEXINGTON, Ky. - Canada's Trey Lyles is headed for the NBA as one of a record seven Kentucky players who announced they'll enter the draft. In a news conference Thursday, the 19-year-old guard from Saskatoon, along with Willie Cauley-Stein, twin guards Andrew and Aaron Harrison and freshman forwards Karl-Anthony Towns all said they will turn pro. Also entering are seven-foot reserve centre Dakari Johnson and backup shooting guard Devin Booker, completing an exodus by the Wildcats' top seven scorers. "It's been my dream since I was seven years old and now to finally be able to make that move. . . it's crazy to think it's happening now," Lyles said. The 6-11 Towns could be the first player chosen overall on June 25 and Cauley-Stein and Lyles could soon follow with both projected as possible lottery selections. Booker is also a potential first-rounder, with the rest projected to go in the second. Lyles, whose favourite team growing up was the Los Angeles Lakers, said he hasn't thought about how high he might go. "I just know if I'm lucky enough to get drafted I'm going to go out there, I'm going to chase my dreams and I'm going to work harder than anybody else," Lyles said. Lyles posted a long note on Twitter, thanking — among others — his Kentucky teammates "for the brotherhood we created, on and off of the court. It was a blessing to be part of such an amazing team, with a bunch of selfless guys that only wanted the best for one another!" In 2012, five Kentucky underclassmen plus senior Darius Miller were selected following the school's eighth national championship. This year's tall, talented squad made a determined run at history with a school-record 38-game winning streak that kept them atop the rankings all season. They were the prohibitive favourites to win title No. 9 and become the first unbeaten champions since Indiana in 1976.